Most people think there are only two ways to deal with debt: pay it (good) and don’t pay it (bad). Paying your debt can redirect money away from important things, like retirement account contributions. Not paying debt can lead to high interests, poor credit ratings, and collection agents calling you all the time. There is actually a third option: a debt elimination strategy. Just as you should invest smartly and efficiently, you should likewise pay debt in a carefully constructed manner. This allows you to manage your obligations while having the wiggle room to focus on important financial objectives. A debt elimination strategy seeks the most efficient manner to pay down debt. This can mean in many cases settling for lower amounts, reducing interest rates, or staggering accounts. 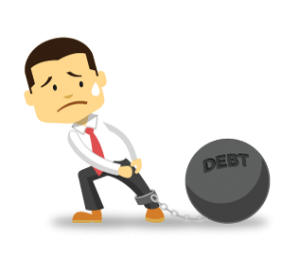 Debt elimination is a key area of focus for my practice because I know how overwhelming debt can be and how it can prevent you from achieving your larger financial goals. Although every individual will have a unique situation, I focus on the most efficient and advantaged solutions to build your custom debt elimination strategy. It is not enough to know that have you have debt, but you also need to identify what your goals are—you have to know what you are working toward. This is where some people fail in their debt management. This is why it is so valuable to work with an experienced professional in establishing your financial goals. As a trusted advisor with years of experience, I am your key partner to crafting your debt elimination strategy. Fill out the form, or call me at 919.518.7728 to get started. Please fill out the form below to learn more about debt elimination.